This week is all about holiday meals, and today is no exception. 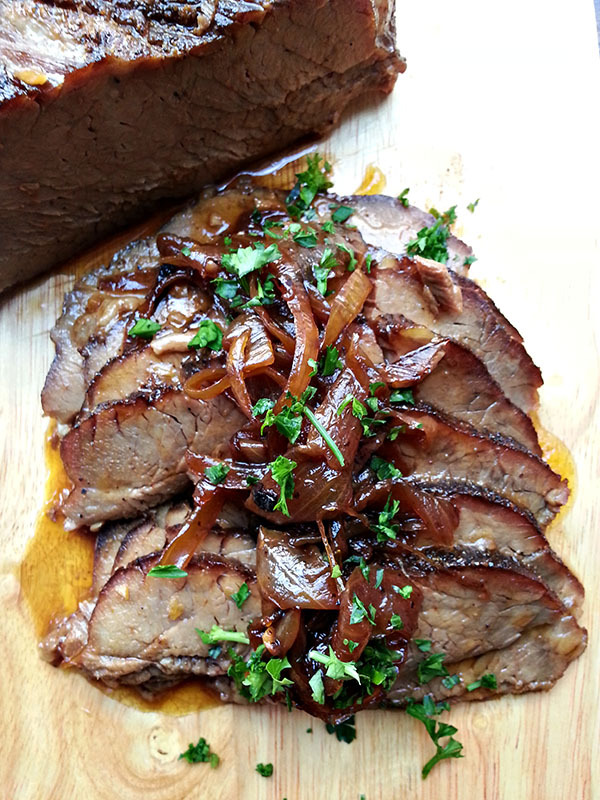 Beer braised brisket with onion jam is an easy dinner to prepare that can be served for any occasion. 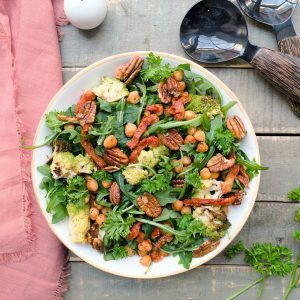 Although it takes several hours to cook, it is kept in the oven during the entire time, freeing up your hands for other dishes you may want to prepare. I personally love anything that is slowly braised. The cooking method allows the meat to break down and tenderize while soaking in the flavors of the braising liquid. What you end up with is fall-apart meat that melts in your mouth. Now imagine that beef with a sweet and slightly tangy onion jam…drooling yet? I know I am and I just ate this meal! Combine salt, pepper, cumin, chili powder, oregano, paprika, garlic and oil in a small bowl. Rub seasoning over the side of the beef without the fat cap. Place the brisket, fat side up, in a roasting pan. Add the beef stock and beef, cover and braise in the oven for 3 1/2 to 4 hours or until brisket can easily be shredded with a fork. Remove from oven. Skim fat from cooking liquid and reserve 1 cup. Prepare the onion jam. Heat oil in a nonstick saute pan over medium heat. Add onions and cook until caramelized about 20 minutes. Add a little bit of water if the pan becomes too dry. Add flour and stir to coat the onions. Add balsamic vinegar, brown sugar, thyme, and reserved cooking liquid. Bring to a boil, reduce heat to low and simmer for 10 minutes. Season with salt and pepper. Serve with brisket. What is braising exactly? It’s a cooking method that combines both dry and moist heat. Most often, the item being braised is first seared on the stove top. This allows the outside to brown and caramelize. It is then finished in the oven in which the meat is slow cooked in a certain amount of liquid. Slow cooking the meat at a lower temperature breaks down the connective tissue, resulting in tender meat. This also explains why tougher meats are used for braising. 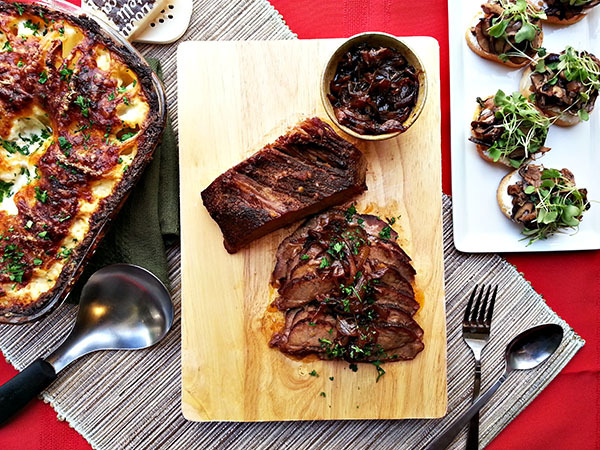 If you cannot find brisket, substitute with a roast, tri-tip, pork shoulder, or even lamb shanks. If you’ll notice, this recipe doesn’t require you to sear the brisket first. However, the beef will still darken in color because of the spices being used. Exactly four hours later and my roast was ready. The meat should easily fall apart without a knife when it is ready. The exterior has a golden crust from the spices and from the color of the braising liquid. The entire kitchen smells phenomenal and it’s hard to contain my excitement at this point! If you’re having trouble slicing the brisket, let it cool slightly. 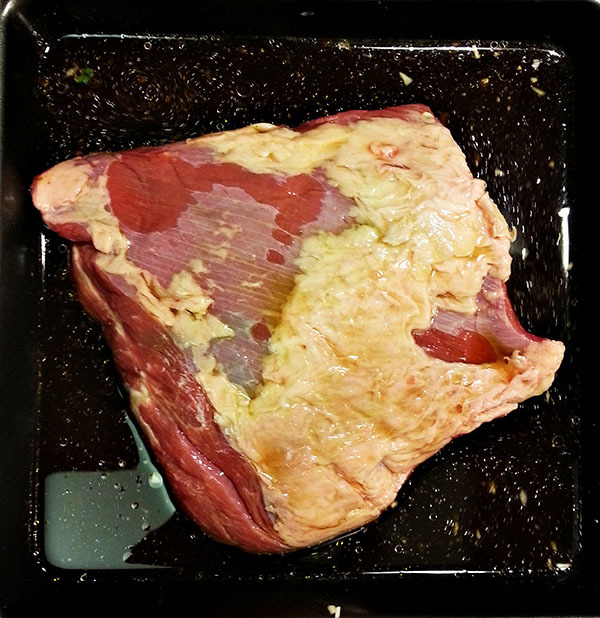 You can always prepare the brisket the day before, slice, and reheat in its cooking liquid when you are ready to serve. For the onion jam, if you’re limited on time, caramelize the onions the day before or while the brisket is braising. Add the seasonings excluding the braising liquid and cook according to the recipe. Once the beef is done, reserve 1 cup of the braising liquid. Reheat the caramelized onions with the braising liquid and cook until the jam has thickened. Remove from heat and serve with the brisket. For my full meal, I started with a lovely mushroom bruschetta with whipped goat cheese. The main course was, of course, this beer braised brisket with onion jam and, for the side, I prepared Hasselback potatoes. The overall meal was fantastic! The beer braised brisket was as tender as expected. The onion jam is a combination of sweet, savory and tangy and a perfect condiment for the beef. You don’ t have to be a meat lover to enjoy this dinner! I also will post a recipe in the upcoming week on what to do with the leftover brisket so stay tuned! I bet this smelled fantastic! 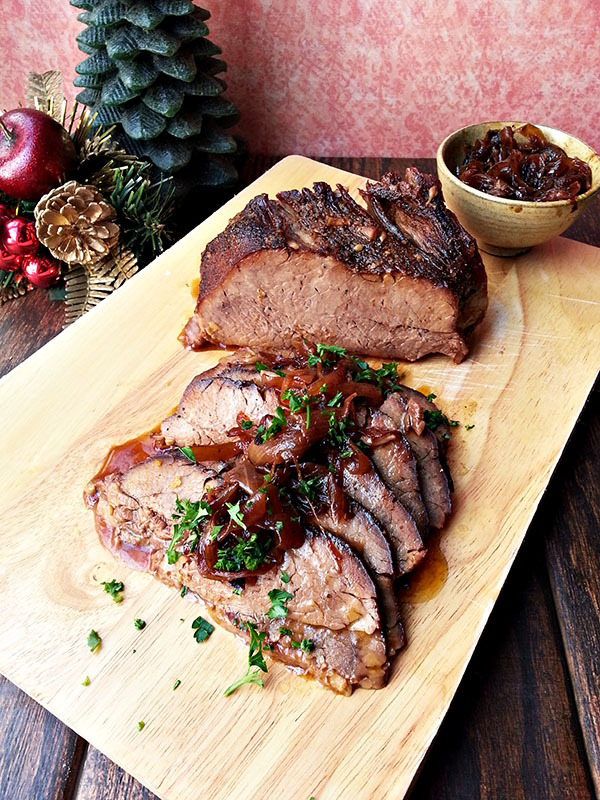 The brisket with the onion relish looks so tasty! You have no idea! 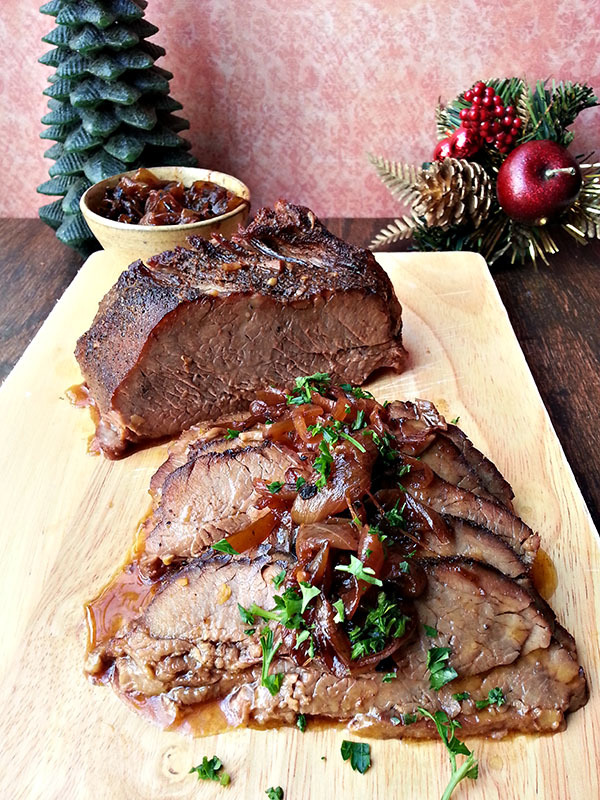 The brisket is already tasty but paired with the onion relish? Heaven! There are no directions included in this recipe. The link to the "complete recipe" takes you to an entirely different brisket recipe. It is the recipe for the onion jam that I'd love to have. Thanks. So sorry about that! 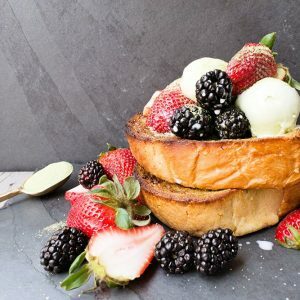 The link has been edited to redirect to the correct recipe. Thank you!